Barack Hussein Obama was born August 4, 1961 in Honolulu Hawaii. His leadership abilities were shown early in his career. In 1983 he graduated from Columbia University with a political science degree. 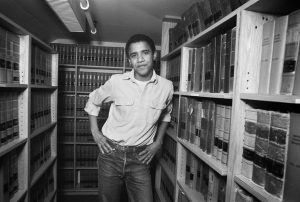 In 1988 Obama entered Harvard Law School and became the president of the Harvard Law review. After graduating from Harvard in 1991 he returned to Chicago to practice as a civil rights lawyer, where he met his wife Michelle Obama. From 1992 to 2004 he thought constitutional law at the University of Chicago. In 1996 he won the election for a seat in the Illinois State Senate. In 2008 he wins the democratic presidential nomination and following against Hillary Clinton. The same year he wins the presidency against the republican presidential nominee John McCain. In 2012 he is re-elected president for a second term (Bibliography, 2017). Barack Obama comes from a diverse family, his mother from Kansas City and his father from Kenya. As a child, grew up with his maternal grandmother in Honolulu and was able to experience diversity from a young age. Barack Obama is a family men who likes to spend quality time with his two daughters Sasha and Malia (n.d, 2017).